Charles Dickens was born on February 7, 1812. In his life, he was one of the worlds best authors, and his still considered one of the best today. He wrote books such as Great Expectations, Oliver Twist, and David Copperfield. One of his most famous book though was A Christmas Carol. It was written and published in 1843. It was set in the Victorian Era and when the industrial revolution was occurring in England. He chose this era because it shows how people in the era felt about poverty, child labor, and Christmas. He wanted to bring attention to them because they were such a big thing at the time, and nobody really cared about the poor people, the children that had to work day and night, and how nobody cared about the Christmas spirit anymore. The Victorian Era started in 1837 when Queen Victoria took over the thrown. Some people say that it was a time of peace and prosperity, but that's only the good side of what happened in that time period. Most people became poor, so they had to send their children off to work, some at the little age of 5. But all of that ended when Victoria died in 1901 and her son Prince Edward took over and got everything back in order. The Industrial Revolution was a time where lots of new technology and inventions were being created in the Victorian Era. During the Industrial revolution, steam-powered machinery, the spinning jenny, which is a spinning wheel that wove clothes, were being invented. And also the telegraph was invented in the time period, and also the first system of railroad tracks. Poverty in England started when the population of many cities increased rapidly during the industrial revolution. During the revolution, they were making new factories that everyone wanted to work in. So it was very hard to find a job. And when you did find a job, the wages were very small. So to keep the family from going into debt, they sent their children to work. When you send your children to work that is called child labor. 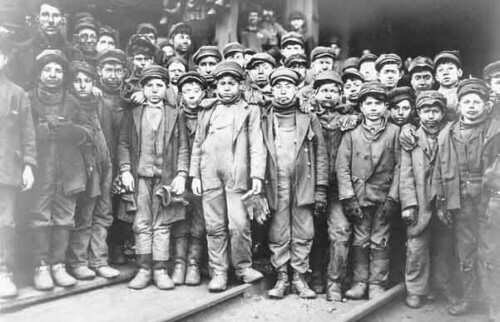 If the kids were sent to work, they most likely worked in a coal mine. In the coal mines it was always dark, there was a lack of proper ventilation, and they had to work at least 12-18 hours a day. Many kids became ill or died, either from their illness or explosions in the mines, which were very common. In 1833 they made laws that limited the amount of hours the kids could work, but it didn't fully get rid of the problem.